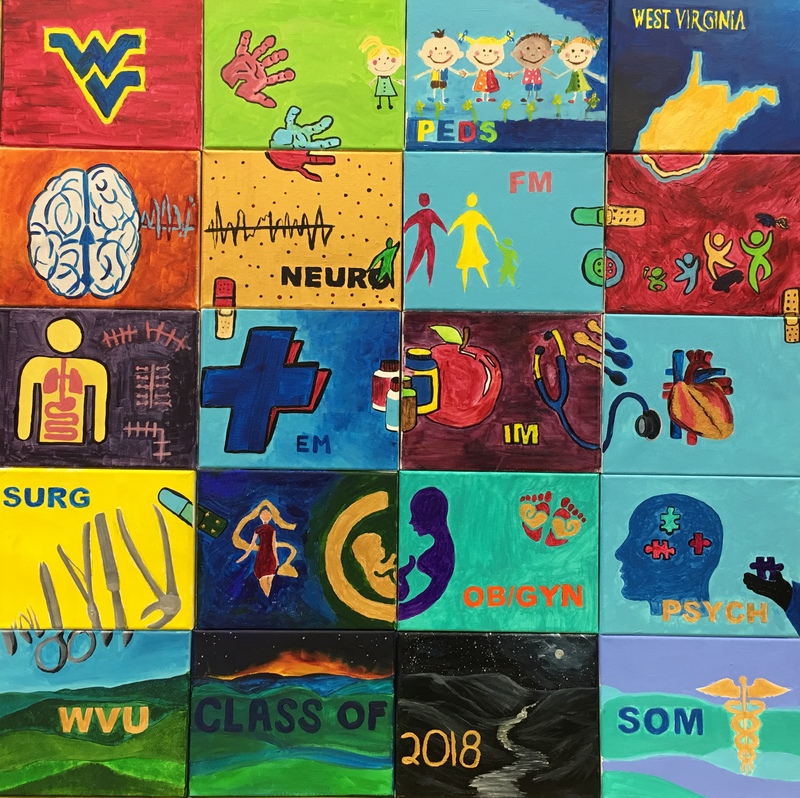 MORGANTOWN, W.Va. – On Friday, March 16, the West Virginia University School of Medicine celebrated Match Day with the class of 2018 medical students on all three medical school campus locations in Morgantown, Charleston and Martinsburg. On Match Day, medical students and graduates from the United States and around the world learn in which U.S. residency programs they will train for the next three to seven years. 100 WVU students matched coast to coast in 23 states training in 17 different specialties, with three successfully matching through t he United States Military program. Nearly half of the class will continue training in West Virginia after graduation, many at sites affiliated with WVU. These graduates join nearly 5,000 WVU School of Medicine alumni practicing or living around the world. Emily Witsberger from Charleston, West Virginia, entered the early match and learned in January that she will complete a residency in ophthalmology at the Mayo Clinic in Rochester, Minnesota. She earned her bachelor’s degree in biochemistry at Boston College but returned to WVU to complete her medical degree. "I think that the role of a physician is one of great privilege and responsibility, and I'm excited to soon be joining this profession that I so strongly admire," Witsberger said. Half the class, 47 percent, will train in internal medicine, pediatrics, family medicine or obstetrics/gynecology, fields that typically represent primary care. The most popular fields this year were the specialties of pediatrics, internal medicine, emergency medicine and family medicine. Some selected training opportunities are not offered anywhere in West Virginia, such as child neurology. (USMLE) exam, which is also required for graduation. This class also has four students graduating with combined M.D./Ph.D. degrees. The combined degree programs provide students the opportunity to earn both the medical degree and the doctor of philosophy degree in areas pertinent to medicine. Two of these graduates matched in radiation oncology – one at the University Pittsburgh and one at Wake Forest University. One matched in pediatrics at Pennsylvania State University in Hershey and one in neurosurgery at the University of Florida. The 2018 Main Residency Match is the largest in history, with a record 37,103 applicants submitted program choices for 33,167 positions, the most ever offered in the Match. The National Residency Matching Program (NRMP) couples prospective applicants with residency programs. Each applicant makes a list ranking the residency program in their order of desirability. The residency programs do the same with the applicants, and the NRMP matches them up. Residency training typically takes three to five years. Residents practice medicine under the supervision of experienced physicians before being certified in a specialty. WVU has the largest number of graduate medical education offerings in the state, with nearly 50 specialty training programs, all of which are fully accredited. One-half of the training programs are the only such specialty programs offered in the entire state. Residency training begins at WVU in July for more than 110 new residents from medical schools across the country. The School of Medicine’s commencement ceremonies will be held on Friday, May 11 at 6:00 p.m. at WVU’s Creative Arts Center. Photo caption: (1) WVU School of Medicine class of 2018 student, Sherif Ibrahim identifies on a U.S. map where his residency match in pediatrics is located – University of Louisville, Kentucky; (2) Emily Witsberger, WVU School of Medicine Class of 2018 medical student, announces where her future residency training location in ophthalmology will be – Mayo Clinic, Rochester, Minnesota; (3) Match Day canvas artwork created by WVU's Eastern Campus medical students.